As long as she can remember, enamel painter Lorraine Bouchard has always had a passion for art and drawing. Beginning at age 10, she sought more formal training through art classes given under the rigorous supervision of the Sisters of Saint Anne. She undertook three years of training in charcoal drawing, five years in oil painting, an apprenticeship in poker work, and flat copper enameling which she subsequently taught within the field of psychiatry. She pursued a night course in 1970 at the Museum of Fine Arts to perfect her art with living models. Through the years, Ms. Bouchard never ceased her artistic exploration outside a busy full-time professional career. Her interests eventually expanded to various media such as ceramics, tole painting and even hat design. A new series of courses exploring enameling arts that she undertook in 2001 opened up a whole new world for this artist. In 2006, she finally quit her job to devote herself more fully to her art. 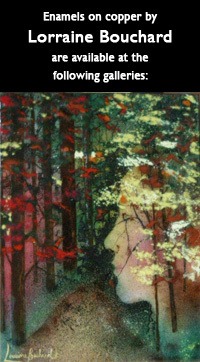 A workshop in 2007 with famous Canadian enamelist Fay Rooke prompted the artist’s discovery of a new work technique. Around the same time, she purchased a new kiln which, since then, enables her to produce larger pieces with dimensions now reaching up to 30” x 36’’. From plain copper sheets, Lorraine Bouchard’s magic unfolds. Alternating between enamel coatings and firings, she brilliantly excels in the rendering of captivating scenery inspired from her cherished daily surroundings. Working with enamel requires flawless precision combined with a deep sense of how different enamel powders vitrify under heat. The remarkable results the artist obtains (very appropriately described by her as the meeting of fire and passion) are solid testimonies of her infinite patience, stunning dexterity and exceptional talent as a drawing artist and colorist. 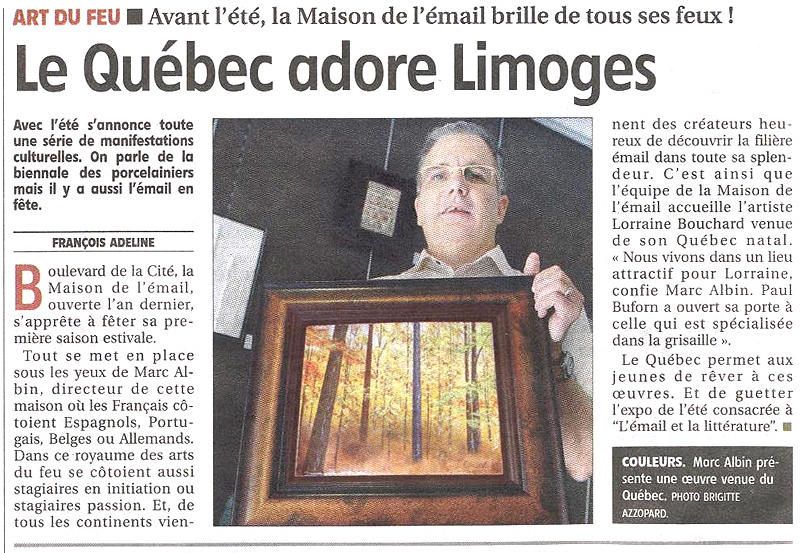 May 31, 2008, La Montagne and Le Populaire (Limoges, France) - "Le Québec adore Limoges"
Lorraine Bouchard at the "Festival des arts visuels de Salaberry-de-Valleyfield"